Home » Microwaves, Ovens & Roasters » Microwaves » What is the Best Microwave Under $100 in 2017? While the market is filled with sleek and powerful countertop microwaves ovens that can do almost anything you want, many of them cost quite a lot. If you’re someone that doesn’t want to spend too much, especially if you’re not going to use it for proper cooking, you can find a good model but inexpensive model instead. Looking for the best microwave under $100 isn’t too difficult if you tone down your expectations on things like convenience features and power. Know that you won’t find a unit that’s more than 1.1-1.4 cubic feet in volume and 1000 watts is the usually the maximum, although 700W is more common. Inverter technology is only available in higher prices models as is and sensor cooking. You can pop corn, heat up a frozen dinner, defrost and reheat foods but actually cooking food can take a bit of time. For more choices of the best microwaves under $100, click on to Amazon now. Otherwise, read on for our recommendations. Note that all these are counter top models, over the range ones cost quite a bit more because of their additional fittings. If you also like baking, roasting and grilling but don’t have space for an oven as well, consider getting a countertop toaster oven microwave combination that combines all these cooking methods as well as microwave cooking. With the Emerson Touch Control Microwave Oven, you can choose from a wider array of colors and finishes to suit your existing kitchen appliances, with each offering a slightly different maximum rated wattage and size. You even have a choice between one with a door handle or one with a push button to open the door. Choose from 0.7 cu.ft., 0.9 cu.ft., 1.1 cu.ft., 1.2 cu.ft. and 1.3 cu.ft. Your choice of maximum wattage ranges from 600W to 1100W and you get to select between 10 or 11 levels of power. The highest power wattage model also comes with a grill function. With 6 auto presets available and express cooking buttons, you have convenience at your fingertips. You can even save your favorite cooking times and power for certain foods. Other functions include time and weight defrost, a digital timer, clock, and a child safety lock. One of the more common complaints here is that the door handle is less than great. However, everyone loves that it is one of the quietest microwaves you can get, making it great for an office. If you love metallics in the kitchen, then the Farberware Classic 1.1 Cubic Foot 1000-Watt Microwave Oven is for you. With a choice between copper, red, stainless steel and white, you’re sure to be pleased with the chic look of any of these. The capacity is 1.1 cubic feet and the maximum wattage is 1000W with 10 levels of power. You can choose from 6 different one touch cooking settings, or use the express cooking buttons from 1 to 6 minutes while also being allowed to add 30 second increments to them. You can use the Memory function to save your favorite meal settings to quickly call them up the next time. This microwave features multistage cooking so it auto adjusts remaining cooking time and power level for each task to give you great results everytime. Defrost by time or weight are the two options for frozen food. This microwave is not the quietest model, as there is noise variation as power levels switch, however, this doesn’t bother most people that much. If you prefer a microwave that offers a grilling option, the RCA RMW1182 is the unit for you. It’s super handy grilling option allows for more ways to cook your food to perfection. It can cook and heat up sausages, potatoes, pizza, fish and vegetables among other things, and you can heat up your beverages such as tea or coffee when needed. Use the quick start and stop button when in a hurry. It provides a generous 1.1 cubic feet of space inside. With its stainless steel interior and exterior it is easy to clean. Its glass turntable and grill rack are included and easily removed for washing. As this RCA runs quietly and offers up to 10 power levels, you will never be disappointed with the results. You may not need to use your wall oven often with this unit, as it uses less electricity and has a maximum of 1000 watts of power output. Never worry about your child being able to open the door to the microwave with its child lock safety feature option. Note that while this does have grilling abilities, you can’t replace a toaster oven for certain jobs, especially for when you need convection heating for baking, etc. You can only add time to the clock when it is already in use, but it’s no big deal when considering all of the other features this unit has to offer. Most customers say that this is the best microwave under 100 dollars. This touchpad controlled microwave is really simple to use even though it comes with a lot of preset cooking options. You can also set the timer and power level manually too with this Danby microwave. You can choose from 10 power levels and you can extend cooking time in the middle by 30 second increments if your initial setting was not enough. If that’s too much of a bother, you can choose from 6 to 11 common cooking functions depending on the model, including cooking a potato, cooking frozen vegetables, or popcorn. In addition to those, there are 3 programs for defrost by weight, cook by weight, and speed defrost. This microwave is available in 3 different size models and maximum power levels. The 0.7 cubic feet is rated at 700W, the 1.1 cubic feet at 1000W, and the 1.4 cubic feet unit at 1100W. You can choose one with a black, white or stainless steel exterior. The Danby is quiet and is made of stainless steel in the interior. A light inside turns on automatically when the door is opened but there is no light during the cooking or warming process. It comes with a child lock too. The smaller 0.7 unit is best used for reheating foods as cooking things like meat can take a long time because of its reduced power. You will also find that its beep is a bit on the loud side. With an average rating of 4.5 stars, this is one of the top rated microwaves in the market. Compact in size and nice looking with a white exterior, most customers like how this Kenmore 0.9 cu. ft. Microwave requires very little counter space. It uses 900 watts of power and is energy efficient. You get 0.9 cubic feet of space and a 10.6-inch glass turntable that’s dishwasher safe. With a simple push of a button you can open the swinging microwave door that also features a child lock. This is something that a few users don’t like, as they’re more used to having a handle to pull. You can select your own cooking or defrost times with power levels and hit start, or explore the six smart touch settings that allow you to do everything from defrost and reheating to popping popcorn and baking a potato. You can stop operation anytime in the middle too. It heats up fast and looks great on the counter. There’s an interior light and an LCD settings display and clock, and a beep alert sounds when the cooking is done. A couple customers mention that reheating takes a bit long. It measures 19″ wide, 11″ tall and 14″ deep. If you’re looking for an inexpensive little red microwave, then look no further than the Hamilton Beach 0.7 cu ft Microwave Oven. It is one of the smaller microwaves, at 0.7 uc.ft. with a 10 inch turntable and rated at a lower 700 watts. 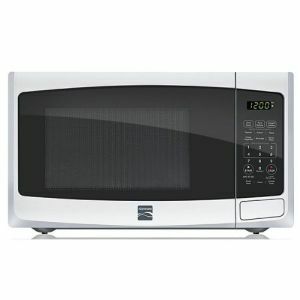 However, ,if you’re looking for reliability and performance at a very low price, this is one of the best microwaves under $100. You open the door by the handle but there is a child-safe lock feature. The maximum size of dinner plates that can fit is 10.5 inches. This makes it a great for a dorm room or office reheating and beverage setup. It comes with 6 preset menu options, the ability to manually set cooking time and choose between 10 power levels, and a convenient way to increase cooking time mid cycle by adding 30 seconds incrementally. Defrosting can be set depending on weight or time. There’s an interior light and an LCD display to show selected settings or the clock, and 5 loud beeps alert you when cooking is over. It measures 17.3 by 13.4 by 10.2 inches. If you like the Farberware Classic microwave above but need a smaller model, then consider the Frigidaire 700-watt Countertop Microwave. At 700 watts and 0.7 cubit feet, it is not meant for large or quick jobs but it works well in a small kitchen while still fitting a full-sized dinner plate. There are just 4 quick select cooking options and 6 quick select time buttons from 1 to 6 minutes with +30 second additions to fine tune heating times. You can choose from 10 levels of power. Of course, you can also just key in the exact cooking time you need and hit start. If you use on of the cooking options, it utilizes two stage cooking to turn out properly done food. A few customers say that opening the door by the handle takes a bit of a tug and that the cord is short, so you need to be able to place the microwave pretty close to a plug point. Other than these small issues, they like this reasonably priced unit very much. Easily operate this Westinghouse countertop microwave with its manual dials and no electronic display. It operates on 600 watts of power and is small in size at 0.6 cu. ft., ideal for apartments and dorms. It is really simple to use but a great working appliance for its price. This Westinghouse provides up to six power levels for light cooking and to heat up food. It comes with a 30 minute timer that alerts you when the cooking is done. The mechanical dial controls makes this a good choice for those averse to or can’t handle touchpad or button controls. You get a grip handle to easily open and close the door to the microwave. The interior light stays on only during the cooking process and not when you open the door. It may slide a bit on the counter so you can counter that by either holding it with one hand while opening with the other or you can add 4 pieces of anti-skid under the feet. For some, this microwave may be a little too small and not powerful enough for real cooking, but it is a handy unit and perfect for couples or single people looking for the best inexpensive microwave that’s easy to use. While all the other models on this list are a bit generic looking, the Nostalgia Electrics RMO770BLK is compact, retro and sleek looking with chrome accents but also has an LED display international time clock and timer with several modern convenience settings. You can buy this microwave in either red or black. Its capacity is 0.7 cu.ft. and is rated at 700W, so it’s not going to warm up a plate in just seconds. If you don’t mind going above the $100 limit, they also have a slightly larger and more powerful one. It comes with 5 power levels and 12 pre-programmed settings that you can choose via the dial. As you turn the dial, the display screen will flash the corresponding program image. You can also pause cooking to check up on a dish in the middle. The rotating turntable is made of glass and can be washed in the dishwasher. Some customers say that this microwave is smaller than expected. Dinner plates will fit but anything bigger will be tight. It is a bit noisy compared to most other models.